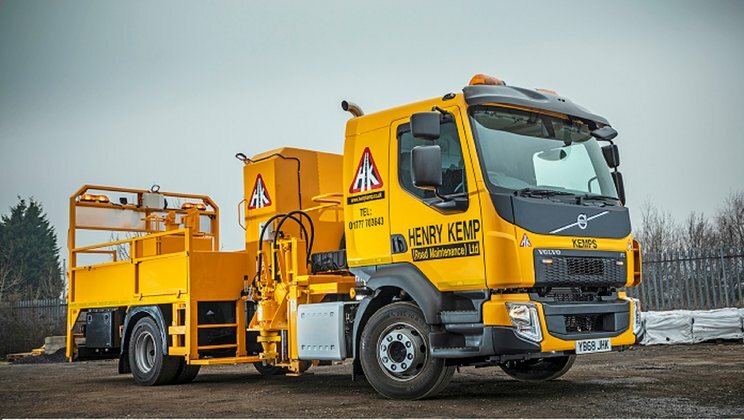 Home Truck News Volvo Trucks Volvo's FL Rigid remains the firm favourite for Henry Kemp (Road Maintance) Ltd.
Volvo's FL Rigid remains the firm favourite for Henry Kemp (Road Maintance) Ltd.
For over a quarter of a century, every year long-standing Volvo Truck customer, Henry Kemp (Road Maintenance) Ltd has added a new Volvo FL rigid to its fleet. The Nottinghamshire-based company runs a specialist business and that means they require specialist trucks, so when spending money on on-board equipment, they need to be certain they have the right vehicle to carry it. For this firm that’s Volvo trucks. Every year, for over a quarter of a century, long-standing Volvo Truck customer, Henry Kemp (Road Maintenance) Ltd has added a new Volvo FL rigid to its fleet. Today the oldest truck currently on their ten-strong fleet is a late 2009 example, with one new vehicle purchased every year since. Supplied by Kevan Morris, Area Sales Manager at Crossroads Truck and Bus Ltd, the firm’s latest arrival is an FL-816 4x2 16-tonne rigid powered by Volvo’s D8K engine rated at 250hp. The new truck also features a six speed, overdrive I-Sync automated transmission system. Ordered as a chassis-cab through Crossroads Truck & Bus Ltd, Rotherham, it has from there gone on for extensive modification and bodywork to prepare it for use installing road studs all over the country. The 8-litre engine fits their bill perfectly, too. “Some weeks when the vehicle goes away it's fully loaded up to 15-tonnes, and the 250hp version is more than capable of handling that payload,” Phil explains.